In this episode of Dynasty Leadership Podcast, I talk with Jon Austin of J. Austin & Associates. He is the guy you should have on speed dial if your business ever has a company-wide crisis. Jon is an expert in dealing with emergency corporate communications and the media coverage (including social media) that goes with it. From airline disasters to food contamination, to 9/11, Jon has seen it all. It’s hard to predict the worst that could happen to your business: your company truck hits a school bus; a salmonella scare breaks out in your restaurant; some of your employees break the law. While these incidents are rare, they can take down a CEO with the speed of a lightning bolt. Jon shares ways that the leadership can plan and prepare for the worst as well as what they should NEVER SAY. Or…they can just make sure they have Jon’s number hand for that dark hour. [1:00] Jon is the person to call when things hit the fan. [1:25] How did Jon get into crisis management? [5:40] What are some of the subtle differences between public relations, and crisis communications? [8:55] What happens if a business wants to open a production plant in a nice neighborhood? You call Jon. [11:30] It’s a challenge to educate and persuade the community towards why a company needs to set up shop in their backyard. Oftentimes, it helps stimulate economic growth. [12:00] Executives in the C-suite position are usually the ones reaching out to Jon. [15:05] In light of the recent Wells Fargo scandal, what steps would Jon take to help ease tension? [18:20] It’s both good and bad, that social media has become so prominent in the last few years. It’s good, because you know someone’s listening. It’s bad, because misinformation can spread like wildfire. [25:00] In Jon’s experience, most business owners and executives stay up late worrying about how to do the right thing. Mistakes just sometimes happen. [30:50] What kind of mistakes does Jon see in his industry? [38:05] Jon talks about how Tylenol recovered from their scandal in the 80’s. 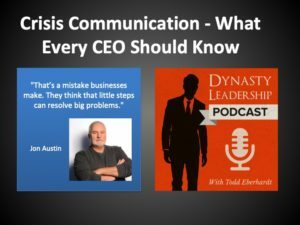 [40:25] What should business owners keep in mind, when handling a crisis? [43:50] Don’t wait too long to tell your side of the story. [46:20] It’s important to be upfront with your employees, when drastic changes are happening within the company.